Isabela is the second largest province in the Philippines. In 2008, the then provincial governor, Grace Padaca, implemented a policy that monitored and evaluated the province’s Ugnayang Bayan (farm-to-market roads) project through its Special Project Office (SPO). The governor, however, wanted a closer monitoring of these projects as well as the procurement of medicines and medical supplies for the public hospitals in the province. 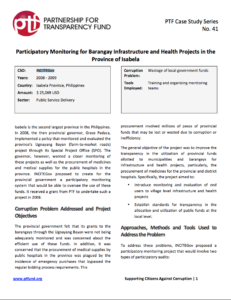 INCITEGov proposed to create for the provincial government a participatory monitoring system that would be able to oversee the use of these funds. It received a grant from PTF to undertake such a project in 2008.